Pinit Sujinphrom, advisor to the Association for the Mentality Ill of Thailand, hosts the eminar at the Redemptorist Vocational School for Persons with Disabilities. Disabled Pattaya-area residents were quizzed on what would improve their quality of life as part of a research project at the Father Ray Foundation. 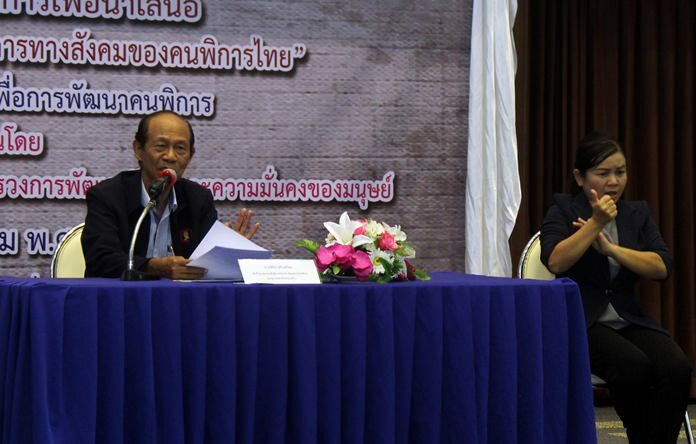 Pinit Sujinphrom, advisor to the Association for the Mentality Ill of Thailand, hosted the Aug. 18 seminar at the Redemptorist Vocational School for Persons with Disabilities. The event was held to present a draft report on disabled Thais in society and to brainstorm ways to improve their quality of life. Pinit asked participants to brainstorm and cooperate in development and propulsion of quality of life for disabled people according to government policy. Participation of the disabled in society, he said, is important in creating recognition, inspiration and equality.